Finally a weekend with good weather on both days! There's still maybe a bit too much snow to go high, so we opt to head to the region around Glarus. After train-train-bus we start in Innerthal. The path leads us out of town and then up, up, up towards the Schiberg and Bockmattli. From the path up we can certainly see the route we'll be taking up the face of the Schiberg, but it's certainly not obvious; this is going to be fun! As one would expect for a sunny Saturday, there are people out and about but it's still early so there aren't really crowds yet. Despite the early hour, there are already a couple of groups climbing the route Namenlose Kante on the Bockmattli; it's a great looking route, but probably not something for a weekend. At the Bockmattlihütte (which is teeny, but very nice looking) we turn off the hiking path and follow a trail steeply up to to the rock. Here we put on our climbing harnesses (just in case we need them at some point) and helmets and start scrambling up. 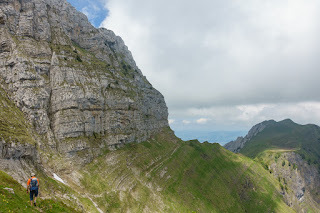 This really is a great route: a mix of scrambling and walking, easy to follow thanks to blue markings and a use trail, really nice views (well, there are some clouds, so it's not what it could be), everything you could want. We're even mostly alone in the route: the only other person we see is a local(?) who powers by us while we're having a food break on the way up. The crux of the route is a 5m down climb that would be scary/tricky (anticipation of this is why we're wearing the harnesses) but someone has put a rope loop in at the ideal spot so it ends up being no big deal. After the down climb we head up some steep grass, then rejoin the ridge for the last bit to the peak at the end of the ridge. 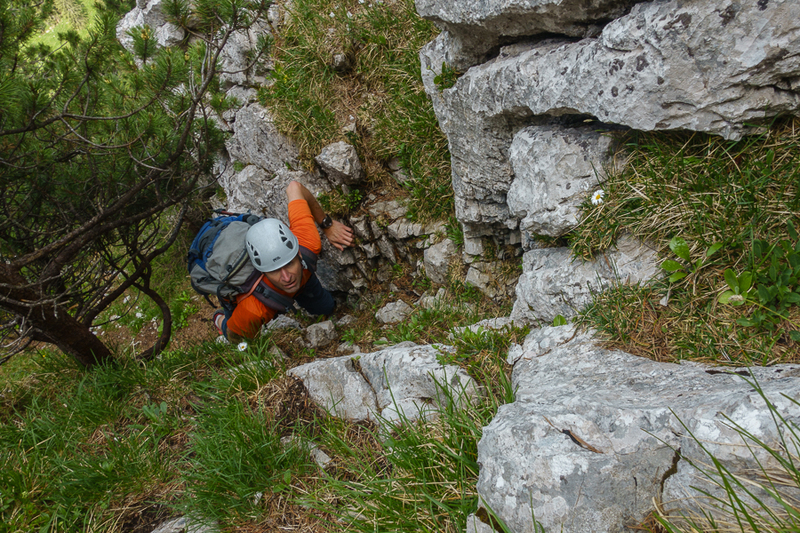 We celebrate the successful scramble (boy was it fun) and then head along the ridge, across the wild limestone formations, to the peak at the end and its cross. 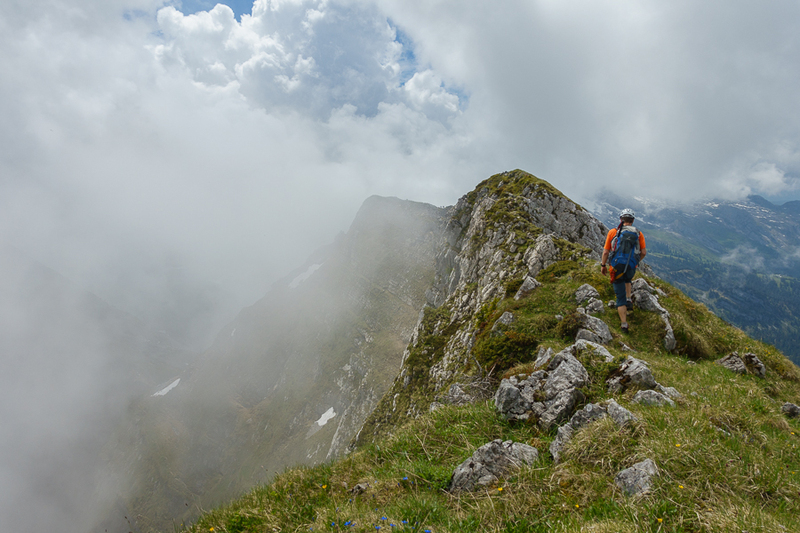 Here we do another food break and enjoy the occasional views through the clouds that are all around us. After the break we head down to the saddle and pick up the blue-white path that leads us across the Schneeschmelzi underneath the ridge of the Schiberg and back to Bockmattlipass. Now it's up, up again to the Bockmattli itself, where have a quick look around before continuing along the ridge towards the Tierberg. At the fork in the path we opt to head down. Now it's down, down, steeply down, along a not-heavily used but well marked blue white path until we hit the houses at Hinter Ahornen. Another short break here and then we continue on down the road towards Obersee. This isn't the most exciting bit of road-hiking ever (though certainly not the worst either), so we're super happy when a local stops and offers us a ride down to the hotel. After refreshing beverages we check in, have showers, do a stroll along the lake, and then have a nice meal before heading off to bed. This was a really nice tour. The feel was almost hochtour, but everything was green. Fun! Stats: 12.5km, 1330m up, 1130m down. Gear: this was Andrea's first tour in her new halbschuhe.